I started with this little stool from Ikea, and though its finish was sleek and modern, I found the shape charmingly antique. I couldn’t resist trying the same technique I had used on my old pine box, which I have loved. 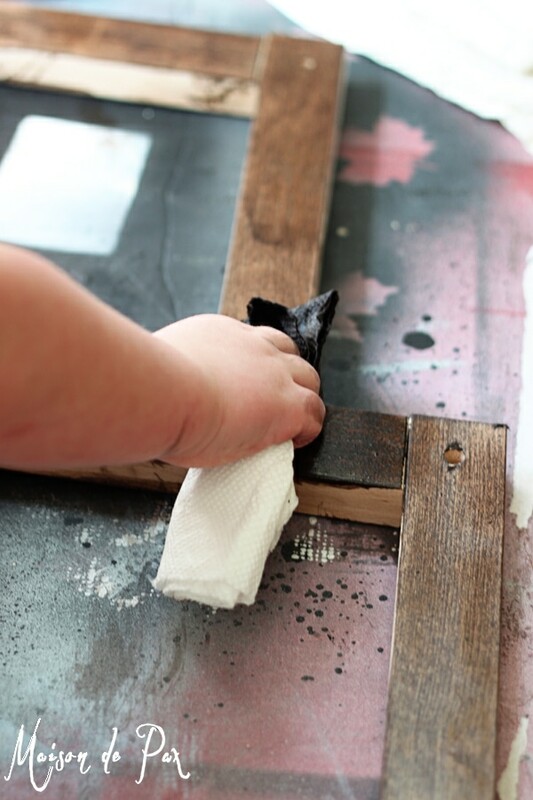 Next, add a little vaseline in natural places where the finish would wear: corners, edges, the steps, etc. 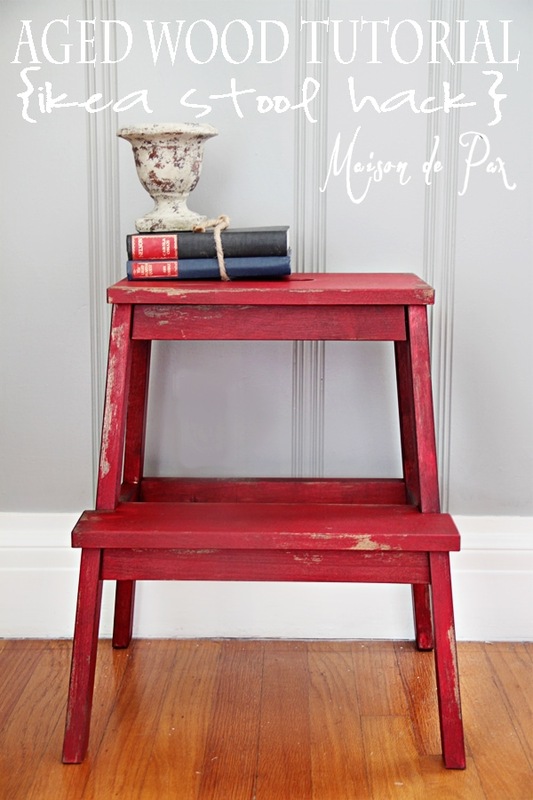 Then paint the entire stool with the milk paint. Finally, use a sanding block or a scraper to lift the paint in places (it should come off wherever you put vaseline, but milk paint has a tendency to chip in other places, too… embrace it!). Once you like the look, seal the piece with a wax or poly for durability and richness. I love how this kind of finish complements so many types of decor, from traditional to cottage to even sleeker modern (like my file cabinet I did last summer). Have you made anything new look old? What kind of stain did you use that allowed you to work on it the same day? Was it and oil base or water-base? I know… red is the most fun accent color, isn’t it? Thanks so much, Julie! Love the red. This turned out really cute! Saying hello from Make it pretty monday! Just adorable. you did a great job. Thank you so much, Linda! I thought it had a nice traditional shape to it. 🙂 So glad you like it! Love the red and what you did–Great job! 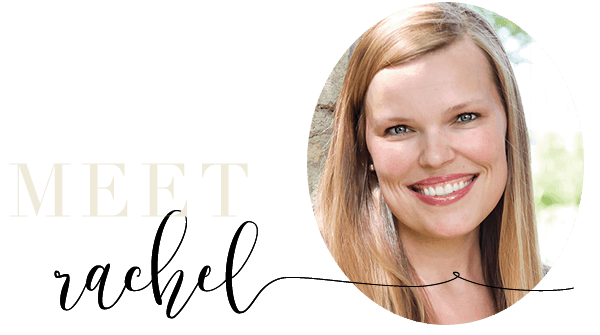 So pretty Rachel- I love the way the milk paint looks – such a different feel. I have to try it one of these days!! Thanks, Krista! 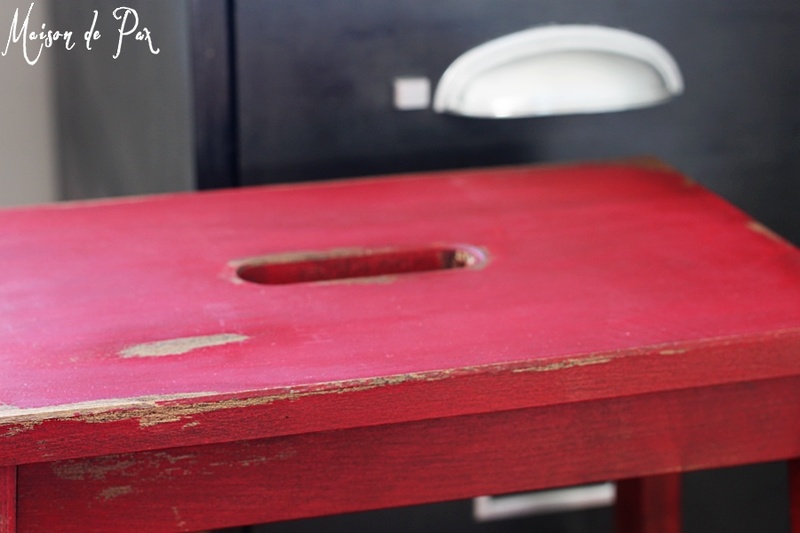 I do think you’d love milk paint… You’ll have to let me know when you give it a try! It turned out fabulous – you’d never know it was new from Ikea !!! This is great, I have this same step and I’ve never done anything with it. It’s still the plain wood and it’s all stained and “dirty” looking. This wood be a great way to do it and looks easy(ish). 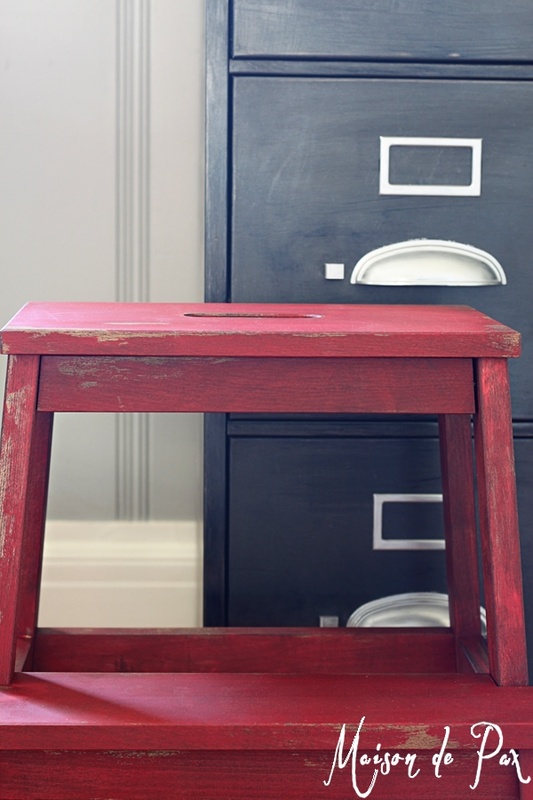 I love, love, love, love this stool! I am in love with the colors! LOVE milk paint! It does have the most incredible texture, doesn’t it, Heather? Thanks!! What a beauty! I love the color of red that it ended up being, too. 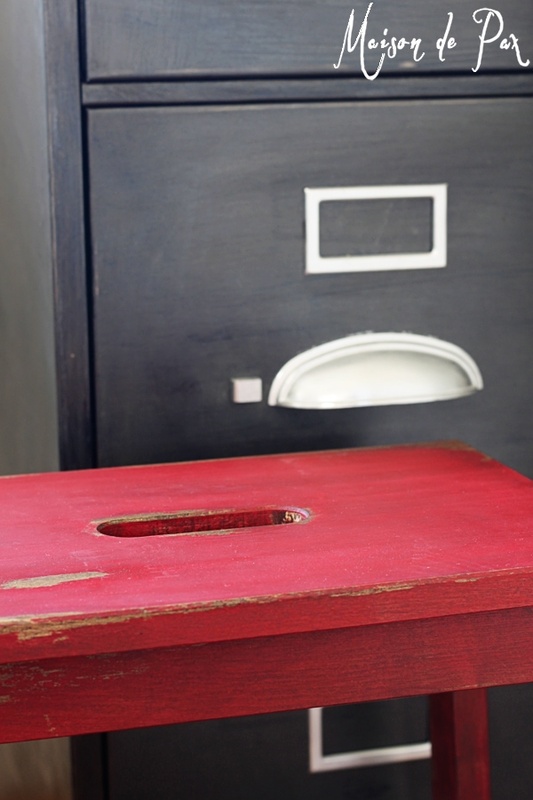 Thanks for sharing at our link it or lump it party! Thank you so much, Amy! The color is great, isn’t it? Thanks for hosting and for your sweet comment! 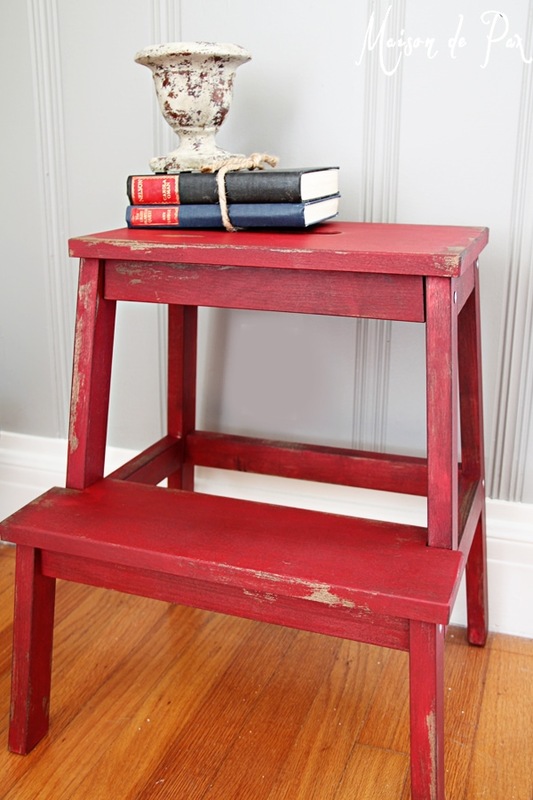 So, I have this same ikea step stool for about 6 years and i like it but it so boring. I am definitively going to try this right after I complete the whitewashed curtain rods which I am super excited about. The one probably silly question I have is whether I can stain this stool in its complete form without having to take it apart and put it back together again? It’s not a silly question at all. The only thing about the old stool is that it will likely have various oils from use that have seeped into the wood, so I would suggest a light sanding to prep the surface to take the stain. Sanding is easier on flat surfaces (which you’ll have if you take it apart), but not required. I hope this helps! Thank you, can’t wait! I am really impressed with your ideas and love your taste. I am glad I stumbled upon your blog. Have an excellent day! Great question. 🙂 I generally paint from a disposable cup. With milk paint, in particular, you mix the paint from powder, so you are only working with the amount you will use. Even with other paints, though, I usually pour into a plastic cup to avoid contaminating the can. And the vaseline shouldn’t be too goopy. It’s a thin layer – just enough to keep the paint from sticking. I hope this helps! Did you use the poly or wax or both on the stool since it gets used a lot.